Populous is one of our favorites and the next 2 weeks promise big news from the team. The original roadmap promised a working Alpha for testing the invoice financing platform by end of summer and they delivered ahead of schedule. The first billion Euro partnership was announced with luxury goods behemoth Luxure Global Citizen who deals in brands like Cartier and Rolls Royce. They even displayed a real invoice for a $300k Lamborghini as part of the deal. The alpha launch and was tested with feedback from real users. This feedback was taken by the team and built into the Beta platform. November saw a promise to release the Beta in Q4 2017 which ends in just over 2 weeks. Rumors seem to indicate the Beta is working on limited release and already working with real invoices for purchase. Rather than simulated products for buyers and sellers to test, the Beta seems to be a functioning product with real transactions for coin holders to actually invest in. Populous (PPT) is looking to join the higher ranks of the new generation of blockchain companies and part of the crypto economy. They have not invested a new blockchain or encryption but instead are launching with Ethereum’s blockchain and based the PPT tokens in the ERC20 platform. This allows the team to focus on the product rather than the programming of a new coin gold rush. This is good news for both Ethereum (ETH) and Populous as it could prove the Ethereum network can produce winners based on the smart contract technology it promised. While Ripple (XRP), Stellar (XLM) and Cardano (ADA) each have different blockchains and coins, Populous is moving forward focusing on the product. Stellar Lumens news coming soon? Populous is working to revolutionize the multi-billion dollar invoice financing market which currently has no central market. Those looking to sell accounts receivable are faced with large interest loans from private lenders or working through bank financing which can be difficult at best. 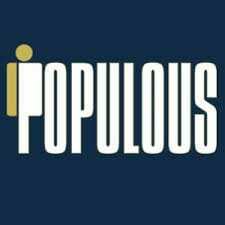 Populous hopes by allowing millions of businesses and individuals access to a free market it can create a more liquid and efficient marketplace for both buyers and sellers. Invoice sellers get the advantage of selling to the masses which allows for competition in hopes to drive prices up and collect a larger percentage of the invoice value. At the same time purchasers hope to have access to more investment markets than offered with traditional financial institutions. This should allow for larger risk but also larger returns than offered on traditional markets. 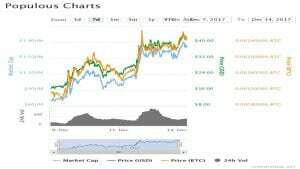 Populous has been moving higher in the last week with the broader crypto market. While not well known by many new investors, it has a close following among early adopters. This creates opportunity with the coming Beta launch. It is very possible the Beta launch is not priced in at today’s $40 PPT price. The Beta launch announcement is coming before the end of the year with a scheduled update for just before Christmas. The recent movement up has been in line with the rest of the crypto coins while Populous has maintained the position in the teens on Coinmarketcap.com. Nothing proves the value of recent news like yesterdays move in Ripple (XRP). The announced partnership with banks in Japan and Korea caused a near 100% gain in the price of Ripple in less than a day. Litecoin also saw a huge move this week on the back of struggling Ethereum and Bitcoin networks under the strain of millions of transactions. News carries volume and volume carries price in this market. This works in opposite also. Any announced delay could knock Populous down a few notches. A 100% Ripple (XRP) type move in Populous would propel it to the top of the news wire for crypto coins. Interestingly, as big a move as that is, it would not carry it to the top 10 by market cap. If there is a Beta launch and a partnership the move could be off the charts. Populous does have a problem with liquidity. The largest market is Binance with nearly $3 million daily volume. It also does not trade on any Korean exchanges which limits upside as Korea is the largest crypto market in the world. Any mention in the update of adding a Korean exchange like Coinone, Bithumb or Upbit would be huge news for Populous. We will update with any announcement here at OracleTimes.com.